My daughter is a Daisy Scout. (A Daisy is the early stages of Girl Scouts.) It’s so cute, really. She’s got a blue vest with a Girl Scout pin. And she already has a few patches. I mean, I was a Brownie when I was young so I expected her to get patches. But, nowadays, they get patches for their birthday and losing a tooth. There was even a Father/Daughter dance. Picture this: a bunch of Kindergarteners all dressed up going to a dance with their daddies. So freakin’ cute, let me tell you! Anyway, after we got through all the cookie sales (“Jordan” sold 115 boxes) the leaders decided to have a barbecue to celebrate their accomplishments. I, of course, volunteered to bring cookies. Because, um, I have a food blog, remember? Perfect fit. But what kind of cookie do I bring to a Girl Scout function? S’mores cookies, of course. It was around this time I was on the quest to find a perfect chocolate chip cookie. I used the traits of what I loved in so many other recipes and came up with this cookie base. But plain chocolate chip cookies, while awesome, can be boring. I mean, go to a potluck and you’ll find three choices, many from big-box grocery stores. Awhile ago, Picky Palate (awesome blog, check her out!) made several recipes involving stuffing things in chocolate chip cookies. One such recipe was stuffing an entire s’more into a cookie. Genious. I didn’t want to do the same thing she did, but I wanted something along those lines. So I thought, why not use marshmallows and chocolate covered graham crackers? 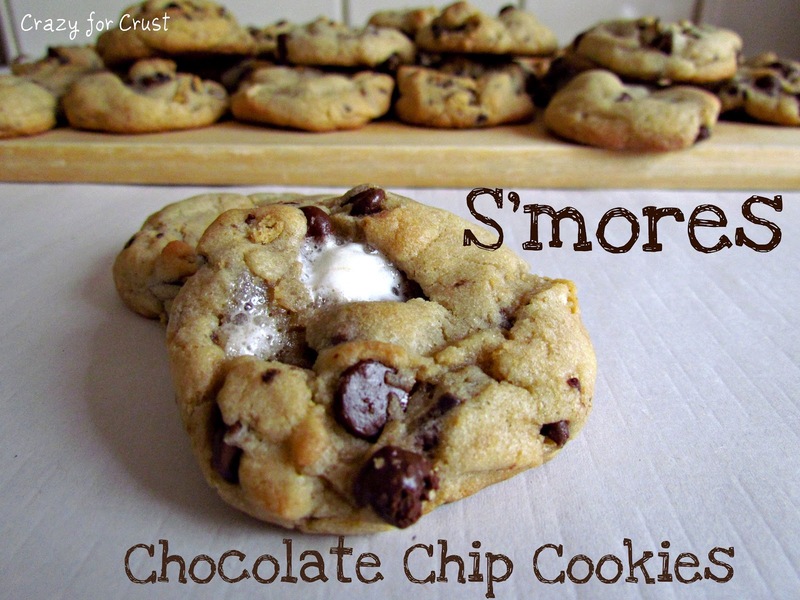 It’s all the ingredients of s’mores, chopped up into a cookie. These are super easy to make, they just take a little extra time. Make the cookie dough and scoop out a portion. Make a thumprint in the center, add two mini marshmallows, and roll the cookie into a ball. The chocolate covered grahams are already chopped up in the cookie dough and the cookies will have a gooey marshmallow center. Remember those Nestle commercials from when you were a kid? 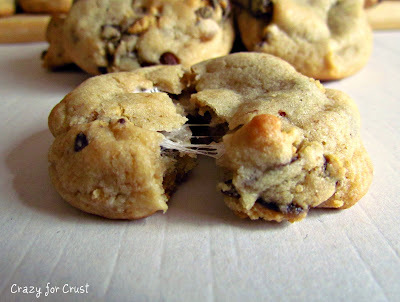 Where the kid pulled the cookie apart and the chocolate chips made chocolate strings? I always tried to do that and never succeeded. Works with marshmallow centers, though! I made these the day before the BBQ for Daisies. Then it rained the day of the event, so it was postponed for two weeks in the future. I froze the cookies. Two weeks passed, it rained again. So, these cookies were in the freezer for a full month before using. And they tasted as good as when they went in the freezer, so make them ahead if you need too! Happy Memorial Day everyone. Let’s all remember our heroes this day. To my dad and my step-father in-law, (both former navy members and Vietnam veterans) thank you for all that you’ve done. I appreciate you! 1. Melt butter in a microwave safe bowl. Pour into an electric mixer fitted with paddle attachment. While still hot, add both sugars and mix on low until combined. Let sit to cool for a few minutes. 2. While butter mixture is cooling, combine flour, baking soda, and salt in a medium bowl. Stir and set aside. 3. Turn mixer (with butter mixture bowl attached) on low. Add eggs, one at a time, mixing completely. Mix in vanilla extract. Add flour mixture to the wet ingredients and mix until combined. Add chocolate chips and chopped fudge-covered grahams and stir to combine. 4. Chill for 30 minutes to one hour, until cooled. 5. Preheat oven to 350°. Form cookies using a 2-tablespoon (medium) cookie scoop,Make a large indentation in the center and add two frozen mini marshmallows. Wrap dough around marshmallows and seal to combine. Bake for 10-12 minutes (depending on size). My cookies baked in 11 minutes. Let cool for 5 minutes, then remove from pans to cool completely. Yummy, will definitely try these! These look really great! I love the gooey-ness of them! 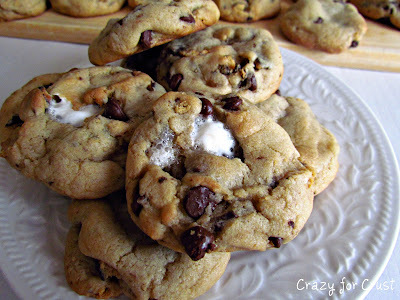 I looked through a ton of s’more cookie recipes and this one sounded like the best one to me. I made them to take to my friends’ house and they were a resounding success. Everyone loved them and said that I better make sure to hold onto the recipe! I’m so glad you liked them Kimberly! !